2,000 Programs of Sharing Christ's Love! 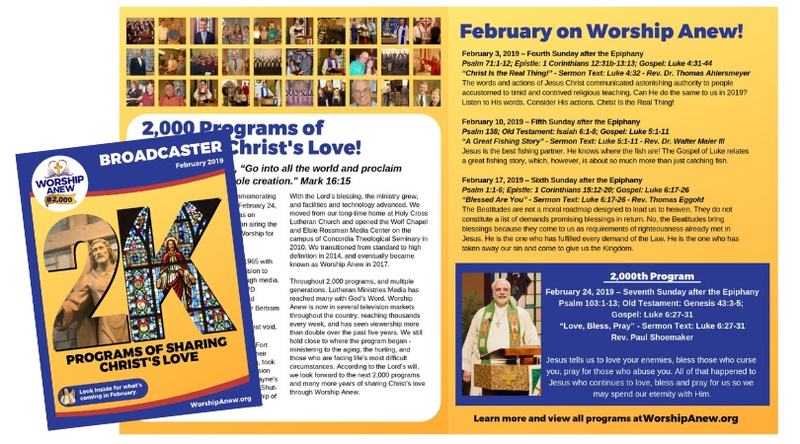 Lutheran Ministries Media is commemorating 2,000 programs on the Sunday, February 24, broadcast of Worship Anew. It was on October 5, 1980 the ministry began airing the weekly program (then known as Worship for Shut-Ins). The story of the ministry began in 1965 with Rev. Oswald Bertram, who had a vision to reach people with God’s Word through media. The program was filmed at the WSPD television station in Toledo, Ohio, and broadcast until the Lord called Pastor Bertram to his eternal home in May of 1979. Production then ceased, leaving a great void. Soon, Holy Cross Lutheran Church in Fort Wayne, Indiana, seeing the needs of their congregation and the surrounding area, took up the challenge of restarting the television ministry. And in the fall of 1980, Fort Wayne’s WPTA began broadcasting Worship for Shut-Ins for the first time under the new flagship of Lutheran Ministries Media, Incorporated. With the Lord’s blessing, the ministry grew, and facilities and technology advanced. We moved from our long-time home at Holy Cross Lutheran Church and opened the Wolf Chapel and Elsie Rossman Media Center on the campus of Concordia Theological Seminary in 2010. We transitioned from standard to high definition in 2014, and eventually became known as Worship Anew in 2017. Throughout 2,000 programs, and multiple generations, Lutheran Ministries Media has reached many with God’s Word. Worship Anew is now in several television markets throughout the country, reaching thousands every week, and has seen viewership more than double over the past five years. We still hold close to where the program began - ministering to the aging, the hurting, and those who are facing life’s most difficult circumstances. According to the Lord’s will, we look forward to the next 2,000 programs and many more years of sharing Christ’s love through Worship Anew. Click “View/Download” above to read the full January 2019 Broadcaster including what's coming up on Worship Anew.